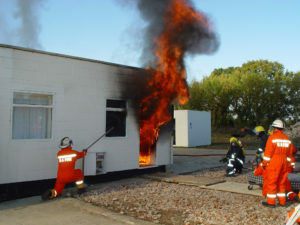 Since 1995 Gardiner Associates has been providing fire/arson investigation training programmes. In 2000 we began delivering practical courses at the Ministry of Defence Police HQ at Wethersfield, Essex. Within the confines of this former air base, a range of specially constructed compartments enabled fire/arson scene examiners to hone their investigation skills in authentic environments. In 2010, the opportunity was presented to acquire almost the sole use of land outside the perimeter of the base, where we have constructed a new fire/crime investigation training, test and research facility appropriately named ‘Phoenix Heights. ’We chose the name in tribute to the Peter Kay popular comedy TV series, Phoenix Nights, which was about a social club (called the Phoenix), which was burned down twice and arose from the ashes. Co-incidentally the Days Inn Haverhill is located in Phoenix Road.. The new fire compartments are decorated, furnished and electrically energised, prior to fires being initiated by various means e.g. domestic accident, electrical supply/appliance fault, incendiary devices etc. All fires are fully instrumented, so that each can be remotely monitored from ignition to extinction. These records, together with photos and videos shot before and during each fire, provide students with the means to validate their findings following each investigation exercise. On site we have three fully equipped fire-investigation vehicles, which enable syndicates to operate independently of each other during exercises. There are also separate areas for crime scenes, fire and electrical demonstrations, refreshment and storage. We are implementing a rolling development programme, which will enable us to continually advance, extend and enhance facilities for our students and our training agenda.